Is recycling as we know it really dead? In a word, yes. For a variety of reasons, some global in nature, the way we once collected and disposed of recyclable trash is over. This is a shocking development to park and recreation agencies that have promoted recycling to the public and staff as a means of taking personal and organizational responsibility for the trash they create and to meaningfully reduce their impact on the environment. Suddenly, costs for recycling are doubling, tripling and quadrupling, and many waste haulers and municipal governments are refusing to even pick up recyclables any longer. City after city is announcing it will no longer collect curbside recycling, and those municipalities that continue to collect recyclables may have no place to recycle such waste and will be forced to divert it to landfills or send it to waste incinerators to burn, thereby creating harmful emissions and toxic fly ash. What’s the Problem; How Did We Get in This Mess? In the early 1970s, the environmental movement embraced recycling to live more sustainably and responsibly. Since then, generations of Americans learned to recycle and believed it was their contribution to a cleaner, more sustainable environment. Park and recreation agencies began to develop “behind-the-counter” internal recycling programs, and, gradually, included public participation in recycling by placing recycle bins in parks, community centers and recreation facilities. In the 1990s, however, waste haulers and municipal governments began to move toward single-stream recycling. In this method of recycling, instead of separating recyclables, such as plastics, glass, cardboard, paper, metal and organic waste, at the source into individual containers, all recyclables are commingled in one waste receptacle. Waste haulers promoted single-stream recycling because it significantly reduced hauling costs and increased profits. 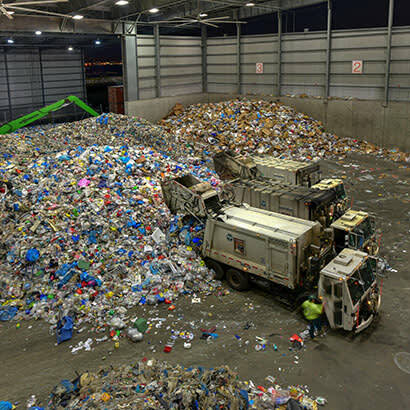 Municipal governments embraced it because it was cheaper and eliminated problems caused by multiple-stream waste pre-sorting, including separate containers, separate storage and greater expense. This mutually profitable arrangement came crashing down in February 2018 when the Chinese government, in response to growing waste contamination and effects of pollution, issued a proclamation, titled “The National Sword,” a declaration that China would no longer accept 24 classes of imported waste and would, henceforth, only accept those materials that met extremely strict standards for contamination. U.S. paper waste is, on average, 25 percent contaminated by food, grease, glass or other materials. China’s new standard for paper waste is .3 of 1 percent contamination. The crisis in recycling has not yet penetrated the consciousness of park and recreation agencies. However, realization will come soon as prices to recycle rise exponentially and waste haulers refuse to take recycled waste, except for exorbitant fees. Such confusion has led to “wishful recycling” or as it is sometimes called, “aspirational recycling.” People who are entirely well-intentioned, but don’t know what trash to put in what bin, throw all their waste into the recycle bin and feel satisfied they are doing their part to improve the environment. What they may be inadvertently doing, however, is contaminating tons of perfectly recyclable waste with their mixed trash. Separating consumer waste sounds simple, but The New York Times recently identified six items that people incorrectly think are recyclable, including greasy pizza boxes (oil saturates the cardboard and ruins it for recycling), disposable paper coffee cups (which are lined with a non-recyclable polymer coating), yogurt cups (which are made of non-recyclable plastic), plastic trash bags (which clog trash sorting machines), oily plastic food containers (which are like the aforementioned pizza boxes) and dirty diapers (which need no explanation). Even Amazon, the biggest shipper of packages worldwide recently got it wrong when it changed from using recyclable cardboard to non-recyclable plastic mailers to reduce packaging volume in trucks and planes. The company claims it will release a fully recyclable paper mailer at an unspecified future date. China’s decision to ban many classes of materials may paradoxically have the net effect of stimulating innovation and competition for recyclables in the United States. Producing cleaner products with less non-recyclable waste will be at the heart of gaining competitive advantage, says TOMRA, a Norwegian-based company that specializes in laser and optical sensors for waste sorting. Uncontaminated recycled paper and cardboard waste, for example, might still find markets in China, but what’s more likely is that the United States may develop local markets for such recyclables. Technological improvements in waste hauling and distribution are already reducing costs of routing trucks and optimizing hauling using fleet-based tracking systems. Such technology can provide real-time interactions with municipal and corporate customers, and reduce the cost of hauling, according to WasteDive, an industry news source. By linking individual vehicles with smart-cities’ data hubs, more efficient hauling can lead to significantly reduced costs. Plastic bottles present a recycling challenge all their own. Polyethylene terephthalate (PET) plastic is one of the most ubiquitous waste materials in our environment. It is now found in abundance in every ocean and in both polar regions. Globally, it is estimated that more than 500 billion plastic bottles are produced each year, but only 14 percent are recycled. The rest are landfilled, burned or discarded in our environment. It is a staggering and depressing amount of waste that could be reduced and re-used. But there may be good news on the PET front. An enzyme that breaks down PET plastic was accidentally discovered by an international team studying bacteria in a landfill in Japan that has naturally evolved to eat plastic. PET plastic, made from oil, “is incredibly resistant,” says Professor John McGheehan, the project leader. Scientists hope that the newly isolated enzyme can be optimized to break down PET plastic faster and on a larger scale than ever before. There is more good news. A recycling plant in Lawrence, Ohio, has recently been licensed to re-process polypropylene plastics, which, up till now, could only be recycled into a lesser grade of grey or black plastic of significantly less value. The new pyrolytic process can produce high-quality, almost clear polypropylene plastic from lower-grade plastics. This technological breakthrough could make recycling of low-grade scrap polypropylene highly profitable, while reducing wastes and costs. These are only a few examples of potential breakthroughs. There is no magic bullet, however, to rescue us from the waste we produce, but technological advances such as these show real promise, even if they are still a long way from achieving economies of scale. Park and recreation agencies have an extraordinary opportunity to educate the public regarding recycling. Possibly some of our greatest contributions toward recycling goals will not be the weight and volume of what we recycle, but the impact we have on changing public behavior. Park and recreation agencies serve millions of meals per year in afterschool and summer programs. The food waste from these meals is mingled with trash. Brendan Daley, director of strategy and sustainability at the Chicago Park District (CPD), notes that his agency alone serves tens of thousands of meals to children in its summer food nutrition program. “Until now,” he says, “all the food waste from these meals has been consolidated with other trash. We are looking at nine park sites to develop a pilot for a comprehensive food composting program.” Chicago Park District is now getting quotes from vendors that can compost food waste. To begin, CPD plans to compost fruit, vegetables, cardboard boxes and possibly bread, but not meat or dairy. That is not all. The district is working with its meal supplier to evaluate menus and how meals are packed with an eye to reducing waste up front. In addition, it will begin a staff training program and is planning how to adaptively manage the program once underway. Matthew Norton, sanitation recycling supervisor for East Bay Regional Park District (EPRB), says that in recognition of a changing landscape for recycling, EPRB utilized a consultant to help develop a multiyear contract, which includes provisions for trash, recyclables and organics at one of its large regional parks. In other parks, it uses local haulers and as many as 10 different firms at a cost of $0–$316 per ton, depending on the location and the park. EPRB also contracts with a California-based crew of the Student Conservation Association (SCA) to collect recyclables from trailside containers on its extensive trail network, and the SCA keeps the proceeds it realizes from recyclable waste. Some East Bay parks also collect organic materials, including food scraps and paper towels for composting either on-site or to be hauled to off-site composting. Park-generated and community-based food composting is clearly an innovative recycling effort that can provide solutions to reducing the number of contaminated recyclables and to diverting waste from landfills. Certain recyclable materials are no longer profitable, yet others retain high value. Glass, for example, is not just unrecyclable, it has negative value and many waste haulers no longer even want to pick it up. Aluminum, however, is 100 percent recyclable and there is excellent value in recycling it. It is also a great way for park and recreation agencies to engage with volunteer and community groups to realize a return on recycling. There is new hope that returning to mixed-stream recycling can make recycling profitable again. “Clean-stream” and “Pay-as-you-throw” recycling may offer hope for the future and, in fact, may open new domestic markets for recyclable wastes that were formerly shipped to foreign countries. Returning to dual-stream and multi-stream recycling is a way forward for agencies and communities to make recycling work. In parks, it can be more than just a better way to recycle: It can also be an effective way to educate the public on how to recycle at home. It will take a collective effort to recycle in smarter ways. Agencies may need to commit to some self-hauling of recyclables to a processing center. Other specific actions to reduce waste or divert it from landfills include upcycling formerly discarded materials; reducing unnecessary packaging in purchasing, eliminating single-use PET water bottles and installing water filling stations. The messaging to the public about recycling is vitally important. We may have to do things a different way, and, perhaps, it won’t be quite as easy as it has been, but the benefits will be greater, and the impacts even more significant, in a climate-changing world. Recognize the crisis and act now. Prepare for what is happening. If you haven’t formed a Green Team yet, now is the time. Activate and empower employees to devise better ways to improve recycling and reduce waste. Review your recycling contract. Look for alternatives to current practices that send recycled materials to a landfill or incinerator. Consider consolidating contracts, building in greater flexibility to meet changing conditions and seek help for writing a smarter recycling contract. Look to reduce waste at the source. Set goals for reducing landfill or incinerator waste and track the amount of waste you divert from landfills as you track the amount of waste you recycle. Perform a trash audit and incorporate findings into your sustainability goals. Improve purchasing procedures to reduce packaging and eliminate unnecessary waste. Consider a food waste composting program. You can start small but plan with an eye to the future on how you can ramp up. Organics composting is a great way to partner with community organizations and a great soil amendment to use in your own gardening programs and landscaping, thereby reducing costs and providing new ways to educate the public. Make your recycling bins “future ready.” If the labeling on current bins is not perfectly clear to the public, consider updating and replacing graphics. If you are purchasing new bins, make them as adaptable as possible for new waste-stream separation. Want to hear more about recycling issues and solutions? Listen to a lively exchange by Chicago Park District’s Brendan Daley and NRPA’s Richard Dolesh on NRPA’s podcast, Open Space Radio, Episode 034. Richard J. Dolesh is NRPA’s Vice President of Strategic Initiatives.